We are a land of followers and not of leaders. Probably true for all cultures. That’s why we go crazy for sports like cricket in our own country or for football all over the world, where spectators are slobs clapping away to glory for the few entertainers in the park. We, the followers, give demi-god like status to anyone who is slightly better than us. We desperately look for a leader to follow. On the other hand, in running middle and long distances like 10 kms, half and full marathons, thousands of regular folks walk and or run together. Sadly so, in India, only a handful would be cheering for them. It was simply brilliant last Sunday to watch Mumbai Marathon being covered on a national TV, that too for hours together, where the achievements of common women and men were being celebrated. It seems like running has really caught on in our country. Or has it? For Mumbai marathon runners from across the country congregate, this year only 6,722 were running the full marathon, as compared to 35,105 running London marathon way back in 2005. Less than a 100 covered the distance in under 3hrs 15min in Mumbai, whereas as over 2,500 runners did the same fourteen years ago in London. :) No, it’s not about me. It’s far bigger than that. Fourteen freaking years ago! Let that sink in. That just shows where we stand as a society fitness wise. If the common people don’t move and are not active enough, it is all a waste of time talking about how many medals and trophies we can win at international level. In any case, those medals are not a reflection of how fit the society is. They are useful but primarily are helpful with TRPs of all forms. We need to transform into a nation of leaders, rather than followers who clap for all silly things while being an audience alone. No one is extraordinary. Actions are! Last weekend, while the thousands ran races in Mumbai or other places throughout India, three ordinary working class Indians, Munish Dev (35), Mandeep Doon (40) and Praveen Sharma (32), made their way to Brazil135 ultra marathon, running all of 217 kms as a tag team, accomplishing an extra-ordinary feet. They got to the finish line together in 46hrs 45min, showcasing team and sportsmen spirit, characteristics missing in today’s rat race. Praveen, Munish and Mandeep preparing the Indian flavour for the Brazilian hosts. Their war room is in Himalayas, strategies carved out in Mantiqueira Mountains of Brazil. Their common love for long distance running and to challenge themselves to participate in adventurous races, is what makes them stand out. Ladakh has become a second home for them. Between them, they have ran 9 ultras in the foothills of Himalayas. It is here that they have learnt their lessons, fallen down, being beaten and bruised, stood up and have shown camaraderie to support each other. They ran their first half marathons 5-6 years ago, but all three had been active during their school days. When they started pursuing their professional lives, the shift in focus made them sedentary for a few years. 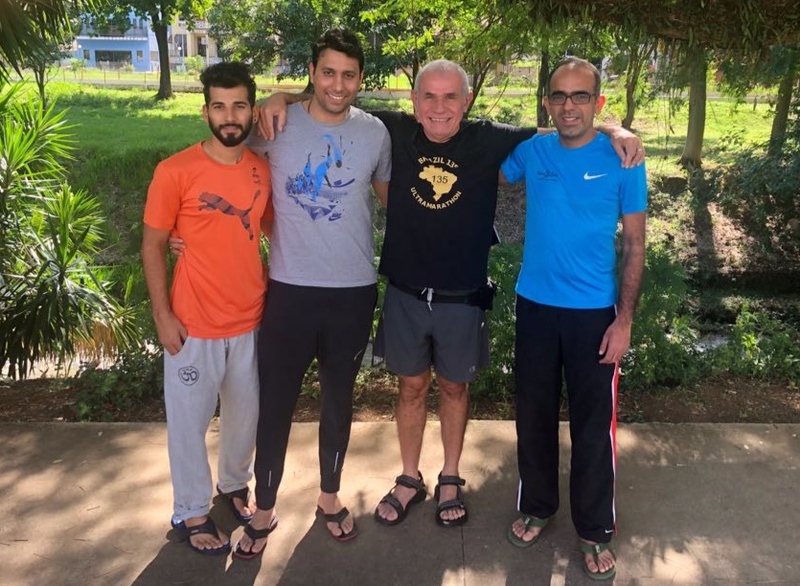 When in Brazil, trio spent lot of time with Mario (race director, Brazil135) to understand the nuances of the race and what it takes for a runner to succeed with the brutal 30,000 ft of climb, heat, humidity, rain, rocky miles and thick muddy clay on the course. Like La Ultra, Brazil135 too is not for the faint hearted. Though the course is amazing with clear and vibrant blue skies and the abundant rich green pastures, but at no point the runner can get carried away by it. The mountains continously beat you down. The trio stuck to their strategy and crossed finish line together in 46 hours 45 minutes, bringing pride and joy for the country. They admit that in those early days of running, they did make the common mistakes of trying to do too much too soon, along with not focusing on strength training. They were lucky to have not got injured but then running taught them well how to proceed with their running and life. They didn’t just land up in Brazil to run a crazy but beautiful race. They first built up their distances slowly & gradually over the years, letting their body guide them. They now were patient and listened to the signals their body gave. They realised that sleep & recovery was as important as running, a simple fact most new runners and fitness enthusiasts totally miss. Another learning for them was not to force or push the body when it wasn’t prepared as in the long run it can have detrimental consequences. For them, discipline has been the most important principle. They would get up and get out every day, as they were clear that results would soon be there for all to see. Last year, Munish Dev was the first Indian to get to the finish line of 333 kms at the 9th edition of La Ultra - The High, a crazy race held in Ladakh, closely followed by Mandeep Doon, whereas Praveen Sharma ran 222 kms category there. In 2017, all three had run 111kms category, for which they had further qualified by running 74 kms at Garhwal Runs, besides having running other ultra marathons too. Among the top, the trio attribute it to La Ultra - The High for what they are today. The race is so cruel and complex that the true character of human comes forth. They feel the sooner one learns to respect mountains and realize one's place amidst nature, more one will start enjoying these runs. According to the trio, diligent preparation, sound strategy, proper execution, team camarederie in ultras plays crucial role. While runner focusses on the run, it is the crew which takes care of everything else. One must enjoy the suffering and have desire and will to help one another during the run. Among the lesson learnt from ultra running, they say self belief, team work, right strategy and perseverance to suffer pain are important apart from respecting the locals and local traditions. Click here to watch a video from Brazil135 ultra marathon and improve your Spanish. Year 2019 has began in a right earnest for these three musketeers and they look forward to participating in other international events going forward. Each one of you are the most important, move to do justice to the one definite life you have. Don’t waste it.